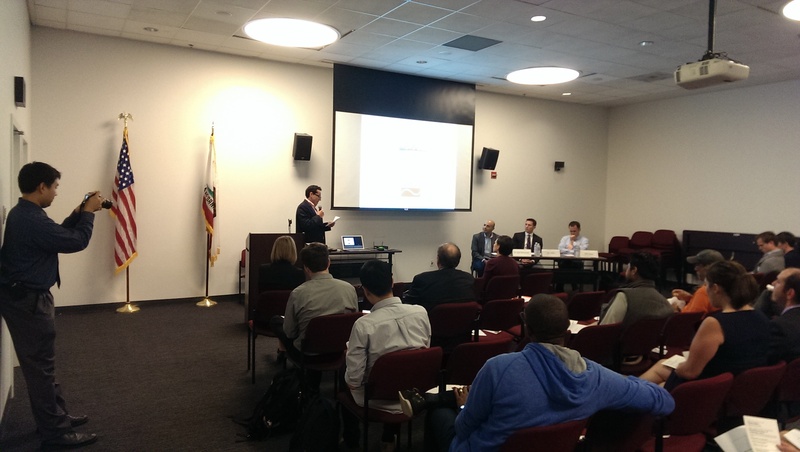 On October 3rd, Young Professionals in Transportation (YPT) organized the “Accelerate >> Los Angeles” symposium at LADOT’s headquarter. The event included a panel composed of professionals from different fields showcasing creative ideas and cutting-edge technologies in transportation. The main goal of the symposium was to exchange and discuss different approaches and techniques to improve Los Angeles’ transportation system. The event was divided into two topic sessions: “Using Big Data to Improve our Transportation Systems” and “Engaging the Public in Transportation Issues”. 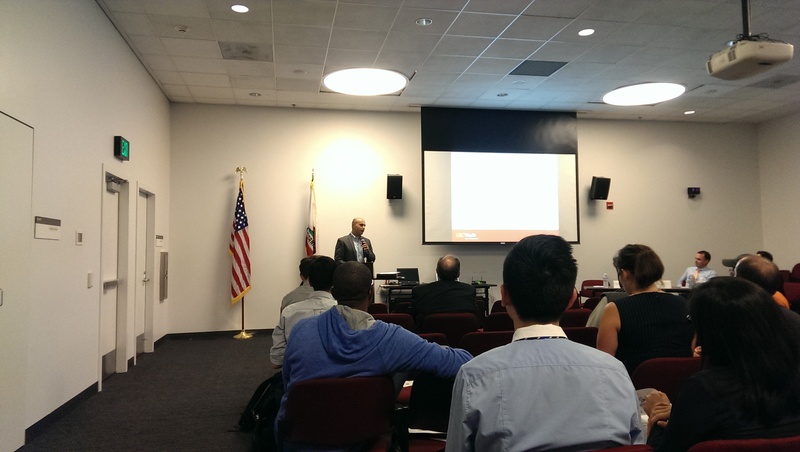 Dr. Ugur Demiryurek, CTO of ClearPath and a Research Scientist at USC, gave the first presentation. ClearPath, his ongoing project, is based on data-driven route planning techniques and aims to plan faster and more precise traffic routes reflecting real-time conditions. Their Archived Data Management System (ADMS) has four components — Input Traffic Data, Data Process, Storage and Query Retrieval/Visualization, which can digest enormous amount of real-time traffic data (46 MB/minute), and analyze and translate it into efficient route plans. ClearPath designed three milestone projects — Stream Data Process, Time-dependent Route Planning, and Event Impact Analysis. Event Impact Analysis: aims to predict traffic accidents base on historic records analysis. All three projects combined will produce accurate, real-time traffic analyses that even factor in accidents. ClearPath has obtained three patents, and test competitions between ClearPath and Google show that ClearPath can save more than 18 percent in travel time over Google Maps with 92 percent accuracy. Rob Hranac, Vice President of Iteris, presented on leveraging big data to manage transportation operations. Starting with a look at the relationship between technologies and methodologies, he pointed out the ultimate goal is not to measure infrastructure (like we do today), but to measure individual trips. He then showed an animated histogram illustrating three month’s worth of individual trip data between Oakland and San Jose during the morning rush hours. His research has expanded to include all-day data. It applies a 3D curve around the clock (a volcano-shape structure) to easily and directly observe traffic patterns and travel times.. In conclusion, Rob shared his vision of transportation management in the future — a real-time picture of every moving vehicle. Ronald Milam, principal of Fehr & Peers, presented on how to use big data in Transportation Planning. Ronald demonstrated his 4-layer pyramid, which build up from Data to Information to Knowledge and eventually to the top — Wisdom. He showcased several successful examples of existing organizations — INTRIX, RS Metrics, and CitySourced (see more below). He pointed out that to create knowledge, one must ask and answer the right questions. Ronald exemplified Pasadena DTA model as a successful practice of achieving wisdom, and closed closed by noting that bigger data is not really equal to better data. In the subsequent discussion session, Ronald raised the privacy issues that arise when using cellphone data to track motorists, which has been a controversial topic in the field. Rob Hranac pointed out that technologies have been improved a lot by using mobile data, and noted that people should recognize privacy may be a trade-off when using these technologies. This session focused on how mobile technologies and social media are changing the way citizens engage with the public sector, as well as prompting new ways to share transportation information that improves our experience of local transportation systems. Lynda Bybee, Deputy Executive Officer of Regional Communications in LA Metro, shared her experiences communicating using social media. Metro has three key areas that use social media — operations, studies, and construction. Operations deal with communicating with Metro’s Board of Directors, customers and media; Studies focus on new dynamics in community impacts; Construction involves informing the public of construction impacts. To sum up, she believed Metro, as a public agency, has a great responsibility to interact with its users positively, and noted that many improvements will be made in the future. Jason Kiesel, founder and CEO of CitySourced, exhibited how CitySourced uses mobile technology to engage the public in an effective way. CitySourced is a platform of crowd-sourcing data including location, media, and descriptive data, where mobile users can report any issue, anytime. He showed several successful examples, including the Clean Air project in Maui, Reno-Sparks’ bike & pedestrian plan, and Redland pavement modeling. In these examples, CitySourced helped public agencies collect large amounts of actual public intelligence to help them make better and more effective decisions. To conclude the panel, Thomas Szelazek, Senior Manager of RideAmigos, shared his insights about how to use web technologies to achieve better TDM. RideAmigos provides web-based, multi-modal transportation solutions, with a strength in commuting network analysis. They partnered with ESRI and successfully developed a cluster carpooling model for city of Santa Monica, which effectively encouraged people to look at options other than driving when planning their trips. They also supported the City of Los Angeles in its launch of the “MyLA311” application for public services and information. In the subsequent discussion session, Jason Kiesel mentioned it’s hard to engage with citizens and hear their voices, and usually only the same small group of people come to public meetings and respond every time. Lynda Bybee concurred that it is difficult to get responses from people who may not be aware of or understand the issues at such meetings. At 8 pm, this YPT symposium closed, leaving us young planners impressed by the panelists’ creative ideas and innovative techniques, and with greater hope for a better transportation system for LA in the future.